A 46-year-old American Society of Anesthesiologists grade I female presented with pseudomyxoma peritonei (PMP) planned for cytoreductive surgery (CRS) with hyperthermic intraperitoneal chemotherapy (HIPEC). PMP is an uncommon slow-growing tumor arising in appendix and ovaries (80%) with diffuse intra-abdominal mucinous implants on peritoneum and omentum. CRS with HIPEC has emerged as an effective treatment for patients with various gastrointestinal cancers, peritoneal mesothelioma, and ovarian cancers compared with intravenous chemotherapy alone. Inside operation theater 16 G intravenous cannulas secured in upper limb and thoracic epidural was inserted at T7–T8 space. After preoxygenation rapid sequence induction done with propofol and rocuronium. The maintenance of anesthesia was carried on using oxygen, nitrous oxide (40:60), and isoflurane. Intraoperative monitoring consisted of electrocardiography, pulse oximetry, capnography, temperature, invasive blood pressure, central venous pressure, hourly urine output, and arterial blood gas at regular intervals. Deep vein thrombosis pump was applied. To avoid intraoperative hypothermia forced-air warming blanket used and warm fluids were administered. 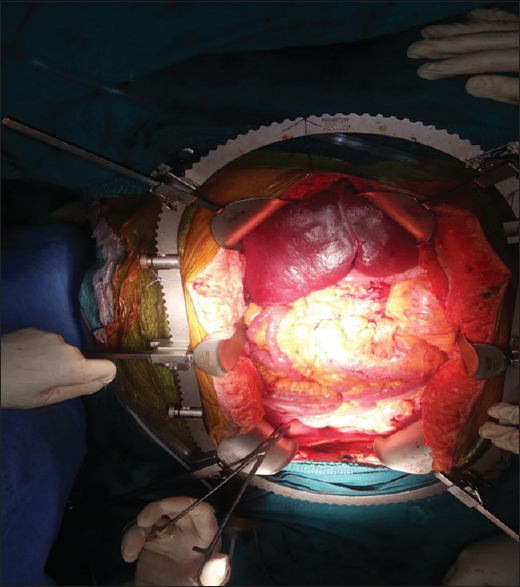 To treat macroscopic disease, complete surgical resection is done during the CRS phase Midline incision extended from xiphisternum to pubic symphysis [Figure 1]. 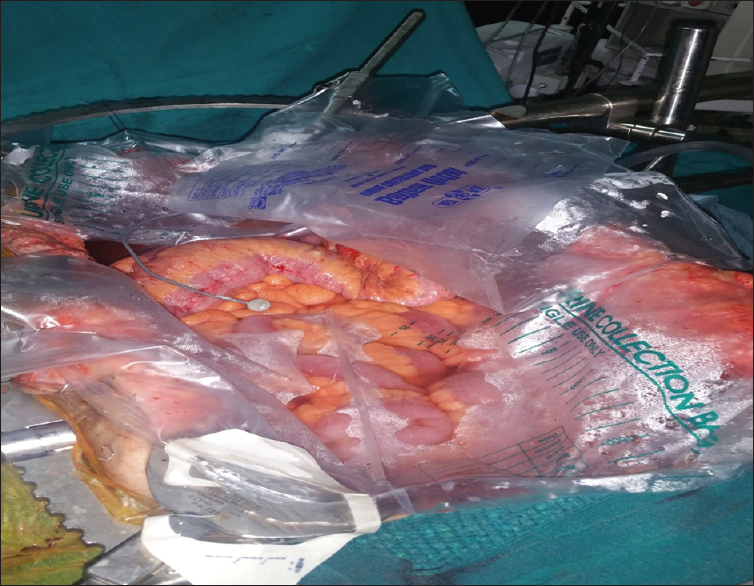 Resection included omentectomy, left hemicolectomy, hysterectomy, bilateral salpingo-oophorectomy, cholecystectomy, and excision of diaphragmatic peritoneum. Total blood loss during this phase was 800 ml. Crystalloids (10 ml/kg/h) were used as maintenance and replacement fluids. CRS phase lasted for 9 h.
Before starting the HIPEC phase forced air heating blanket was stopped, and warm fluids were replaced with cold fluids. For microscopic disease, specific intraperitoneal chemotherapy is administered using 30 mg Mitomycin C dissolved in 3 L of saline which was heated to 41°C–42°C. The solution was then poured in abdomen using open technique. A sterile temperature probe was placed in abdomen to monitor the intra-abdominal temperature continuously and abdomen was covered with plastic cover to prevent any heat loss [Figure 2]. The intra-abdominal temperature was maintained by intermittently in vitro heating the drug solution. The HIPEC phase lasted for 90 min during which urine output monitored every 15 min and arterial blood gas monitoring was done every 20 min. Throughout the HIPEC phase, cold crystalloids (15 ml/kg/h) were infused to maintain normothermia. The maximum core body temperature recorded during the HIPEC phase was 38.4°C, which dropped down to 37.0°C. At the conclusion of HIPEC core, body temperature came down to 37.0°C. Intraperitoneal chemotherapy has the advantage that it acts immediately and can be given in high concentration as compared to intravenous route. Hyperthermia is directly cytotoxic to cancer cells, causing increased drug penetration and is synergistic with some chemotherapy agents. Total duration of the procedure was 13 h. The patient was shifted to ICU for elective ventilation and extubated next day. CRS with HIPEC is a long and complex procedure with significant blood and fluid loss during debulking. Hemodynamic, hematological, and metabolic alterations before and during the HIPEC phase, and even in the early postoperative period may result in significant morbidity and mortality. Hence, the maintenance of normovolemia, normothermia, coagulation status, and pain management are the main goal CRS with HIPEC has now become standard treatment for patients having peritoneal surface malignancies. But as of now, very few centers are performing this procedure because of shortcomings of equipment availability, complexity, and expertise. The available literature shows the use of closed technique only but in our institute roller pumps are not available, and we adopted open technique with limited resources. The outcome was rewarding as patient walked of hospital cancer free on 13th postoperative day. We would like to acknowledge Dr. Neerja Banerjee, Senior Consultant, Department of Anaesthesia, Dr. RML Hospital, PGIMER. Sugarbaker PH, Van der Speeten K, Stuart OA. Pharmacologic rationale for treatments of peritoneal surface malignancy from colorectal cancer. World J Gastrointest Oncol 2010;2:19-30. González-Moreno S, González-Bayón LA, Ortega-Pérez G. Hyperthermic intraperitoneal chemotherapy: Rationale and technique. World J Gastrointest Oncol 2010;2:68-75. Kamal JM, Somaya M, Elsaikh, Dina N, Ahmad MM. The perioperative course and anesthetic challenge for cytoreductive surgery with hyperthermic intraperitoneal chemotherapy. Egypt J Anaesth 2013;29:311-8.